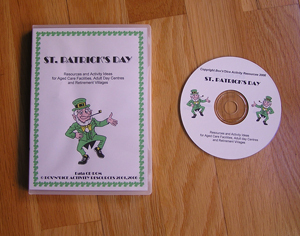 CD version of the St Patrick’s Day Manual of Resources and Activity Ideas. All activities in the manual are included in pdf format on the CD ready to print off. Includes fact sheets related to the history of St Patrick’s Day, traditions and symbols, (useful for discussion and also reminiscing for your clients of Irish background); quizzes, crosswords and other brainteasers, Irish humour, large print words to popular Irish tunes, Irish recipes and more.